When you hear ‘egg-free’ or ‘dairy-free’ attached to a recipe, you’re likely to think ‘taste free’ or that you need some special ingredients. I’m so happy to report that this isn’t the case with this egg-free French toast recipe…It’s yummers! OK, But is it really that easy? Little Miss Mini Yummers has an egg allergy, so French toast (or eggy bread as we often call it in the UK) just isn’t an option. Add that to the fact that I’m in no way a morning person (no matter how much sleep I’ve had), and that will answer your question. There’s no way I’m going to mess around with anything even slightly more challenging than mixing a handful of ingredients together and throwing it in a pan in a morning. The result is the sweet kind of cinnamony French toast that smells so good to the nose and feels so good in the tummy on a sleepy morning. It’s not the kind of savoury eggy bread that my daughter would no doubt dip in tomato ketchup should she not have an allergy to egg. 1. Mix all the ingredients in a wide bowl. It doesn’t have to be a big bowl, but wide enough that you can get a slice of bread in it. 2. 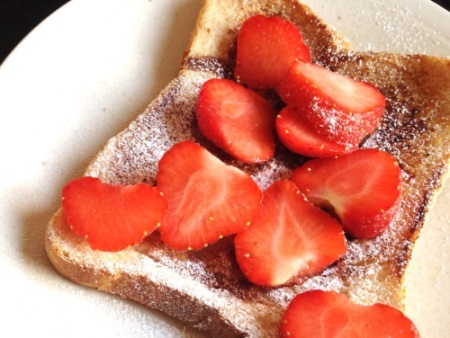 Start to warm up the pan on a medium high heat–use a little spray oil to stop the toast sticking. Put a slice of bread into the mix to soak it up. Turn it over and make sure every bit of bread is soaked. Remember that this mix is for 2 slices of bread, so dip and soak the other slice now if you’re cooking the slices at the same time. 3. Put the slices into the pan and cook on each side for 2 minutes. It’s important to make sure that the custardy mix is cooked and not still liquid, otherwise you’ll be able to taste the cornflour. 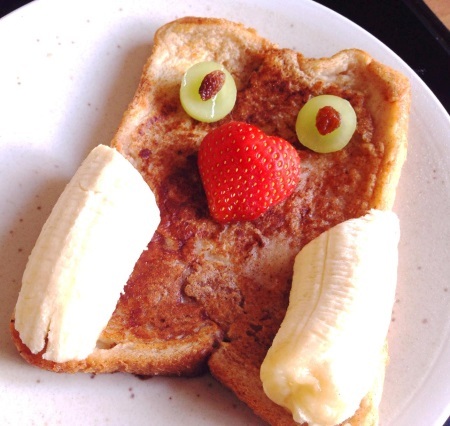 Serve your egg-free French toast with strawberries and icing sugar (powdered sugar), maple syrup, or make a funny little owl from pieces of fruit. It’s yummy either way. Are there any other free-from recipes you’d like to see? Please leave a comment below and let us know. And be sure to subscribe to our newsletter, using the green box at the top of the page, to keep up with more free-from recipes.